The Soap Works Hemp Oil Soap is nourishing to skin with anti-aging properties; hemp oil is rich in Omega 3, 6 & Gamma-linolenic acid. This soap is fragrance free, and long-lasting with an especially creamy lather. 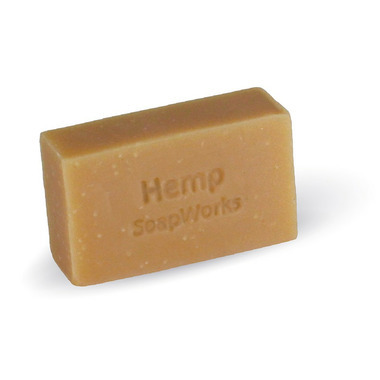 Hemp seed oil makes this one of the trickiest soaps for The Soap Works to make. The Soap Works uses a cold process (like Goat Milk soap) to make this bar. They have to be quick mixing and pouring the soap mixture as it solidifies quickly. The Soap Works uses castor oil to help the soap produce an especially creamy lather. This bar is designed to be long lasting. It is a splendid beauty bar for hands, body and face. Ingredients: Cannabis Sativa (Hemp) seed oil, Sodium Cocoate, Sodium Palm Kernelate, Ricinus Comunis (Castor) seed oil, Paprika. Definitely my favourite soap! Lathers great and moisturizes while you wash.
Nice soap, lathers well, however it doesn't last a long time. Love this soap! Keeps my skin very soft. Creamy, no-scent soap which is safe for people and the environment. I use it as my favourite soap. This is my favorite soap - I have been using it for 4 years. It lathers up well and has no harmful preservatives or chemicals. It also has a very faint scent that is not overpowering. Great & soft for my sensitive skin! Will buy again! Use for teeth plus. Love the ingredient list. Very nice soap. Leaves the skin soft and squicky clean. A great non-irritating soap for chapped hands and sensitive skin. Lathers up very creamy and not scented with perfumes. This is a nice gentle soap that doesn't dry my sensitive skin out.